Over the last few weeks I've been enjoying becoming familiar with the work of "B" movie director Lew Landers. 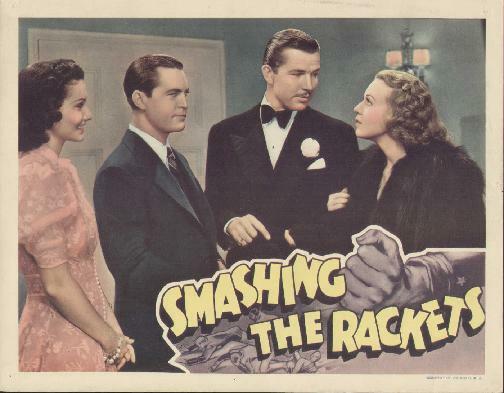 I've seen a trio of Landers films, THE MAN WHO FOUND HIMSELF (1937), SKY GIANT (1938), and THUNDER MOUNTAIN (1947); tonight I added a fourth title to the list, SMASHING THE RACKETS. 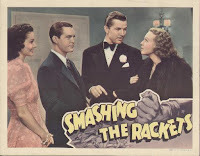 SMASHING THE RACKETS is an enjoyable film starring Chester Morris as Jim "Sock" Conway, an FBI man turned Special Prosecutor who goes after racketeers. Bruce Cabot is the lawyer defending the mobsters who eventually moves in to take over the entire business. Morris and Cabot were a pair of dependable actors who are each fine in their roles, with Morris the stalwart, determined hero and Cabot the calculating sleaze. I always enjoy them, and this film was no exception. Morris, the star of countless "B's," would go on to play Boston Blackie throughout the 1940s, while Cabot is particularly recognized by some due to his long association with John Wayne, appearing in at least 11 Wayne films, most released in the '60s. Conway's romance with lovely Pat (Frances Mercer) gets somewhat short shrift in this fast-paced 68-minute film; at one point the characters make plans to meet for an early morning walk, and I wondered if such a scene had been filmed and cut out, as Pat seemed to disappear from the movie for longer than expected at that point. Although for the most part the film's quick pace works in its favor, a little more early development of Jim and Pat's relationship would have been welcome. Conway isn't above using deceptive tactics to get the information he needs to put mobsters behind bars, and there's a truly shocking scene involving Flo (Edith Craig), an informant, which certainly made me sit up and take notice. Pat's flighty, ultimately unstable sister Letty is played by a young Rita Johnson, in just her fifth film. The cast also includes Edward Pawley, Donald Douglas, Paul Fix, George Irving, Eddie Acuff, Scotty Beckett, Byron Foulger, and Cecil Kellaway. The screenplay by Lionel Houser was inspired by a series of Saturday Evening Post articles by Forrest Davis. 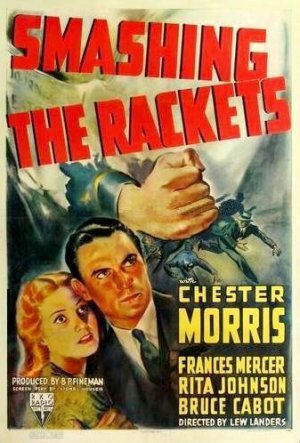 The movie was filmed in black and white by Nicholas Musuraca, who would go on to shoot great noir titles such as OUT OF THE PAST (1947). Turner Classic Movies will be celebrating director Landers' work next month, showing a marathon of 10 Landers films on January 14th. 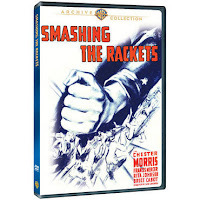 SMASHING THE RACKETS is available on DVD-R from the Warner Archive. Although the film has not been remastered, it's a very good-looking print.